Meccon was the prime/general contractor to relocate and expand the existing Glycol System from North Side of Midway to South Side. The New facility would include five (5) relocated glycol tanks and two (2) new glycol tanks, new landside glycol offloading facility, two new mixing control stations, new operations building, six (6) truck loading positions and 14 deicing truck parking locations with block heater outlets. South Site Improvements – Install and tie in new underground services, water, sanitary and electrical. Install new AOA Panel Fence, re-work site drainage and necessary concrete work. Work was performed in two phases during off season hours to ensure the facility could always support airport de-icing operations. 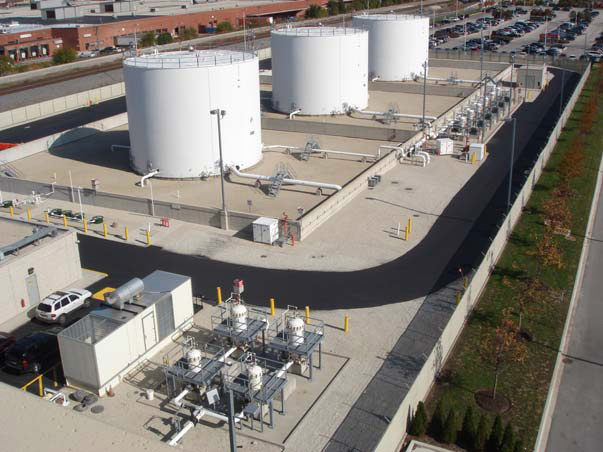 Project scope of work included the complete design and construction of a new fuel storage and pumping facility including tanks, fuel piping, primary electrical power, control/instrumentation, fuel containment and operations building. The Fuel Farm consisted of the construction of three (3) new 15,000 barrel storage tanks (total capacity 630,000 gallons) including site work, concrete foundations, storage tanks, containment dike walls, fuel piping, fire suppression system, site utilities and electrical work. Project scope of work involved the complete development, design and construction of a new forty-four (44) hydrant fuel system. 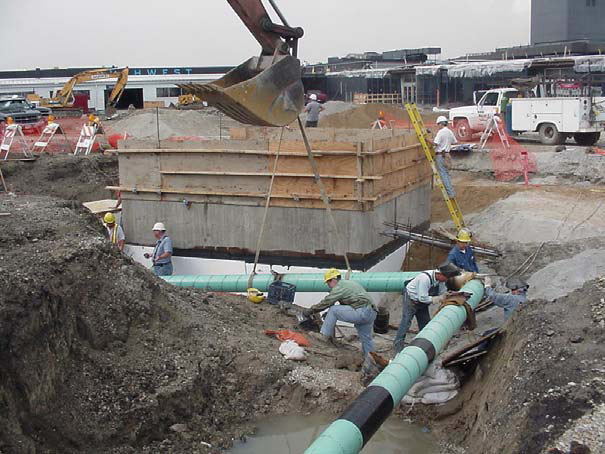 The work included the construction of 10,000 feet of underground 10", 12" and 14" fuel piping, remote refueling station, pipeline cathodic protection systems, concrete isolation valve vaults, emergency fuel shutoff system (EFSO), pipeline pigging and flushing, and system commissioning for service. Project development and coordination with Midway Airport airlines & City of Chicago Department of Aviation. Project engineering and design services. Fuel system quality control and non-destructive testing program. Direct hire of work force for site utilities installation. Development and implementation of fuel facilities flushing procedures. General Site Work including earthwork, road construction & landscaping. Concrete tank foundations & dike walls. Tank fabrication, erection and tank interior and exterior coatings. Meccon performed this project on a Guaranteed Maximum Cost (GMP) Basis, within the project schedule.